Kids can make gobs of gum with this bubble gum factory. Create unique recipes by mixing and matching different flavors. Kit Includes citric acid packet, corn syrup, confectioner sugar, gum base, watermelon flavoring, blueberry flavoring, mint flavoring, 2 note cards, activity guide, and a plastic tin with lid. — Andrea Scartozzi, from Hardware Toys in Paoli, Pa., told TDmonthly in a September 2011 survey that Bubble Gum Factory is their bestselling science toy. — In a late Summer 2012 survey, Joe Berardoni Sr., owner of Pun's Toys in Bryn Mawr, Penn., told TDmonthly that "a certain few of the kits from Scientific Explorer, mostly any one that has to do with food," are their second-best selling Science & Nature item. — Mary Porter Green, owner of Curiosity Zone in Ashburn, Va., told TDmonthly in a Fall 2012 survey that kits from Scientific Explorer are one of their top-2 bestselling educational products. They sell dozens each month. Volcanoes are one of the most awesome forces found in nature. They can shoot rocks and gases miles into the air and their lava flows can outrace a speeding car. Now kids can try that at home. In this kit, everything is included to create a volcanic blast. Volcano really explodes and lava flows, and the kit includes cool science that explains how volcanoes form and why they explode. Volcano erupts up to 10 times. Launch date: August 2010. — In a September 2011 survey, three out of 13 retailers said products from Scientific Explorer were their bestselling science & nature toys. Joe Berardoni, owner of Pun's Toys in Brynn Mawr, Pa., told TDmonthly that "Scientific Explorer's line features colorful, good sized boxes and some great titles." With this kit, kids can investigate crime scene clues and learn about how science plays an important role in solving crimes. They'll also learn how to make & match DNA, analyze mysterious fingerprints, decode secret messages, and more. Launch date: August 2011. With this kit, kids can make gruesome fake cuts, burns, and bruises, just like in the movies, use tricks professional make up artists use, and learn the science behind the movie make up. Launch date: September 2011. Kids can make oodles and oodles of reusable Fuzzoodle combinations. Just pick a Fuzzoodle Noodle, add some parts and pieces, and start creating. Includes: 22 Fuzzoodles, 26 Fuzzoodle parts, and an idea guide. Kids can create over 300 different color combinations with this set of Blendy Pens. Just insert any 2 Blendy Pens into the fusion chamber, and click, twist, fuse. Includes 12 original Blendy Pens, 12 Magic Blendy Pens, and 10 mini Blendy Pens, PLUS 20 bonus Surprise Art posters. Launch date: October 2011. Ideal for the budding scientist, this slime lab allows kids to make some of the strangest, most anomalous slime they have ever encountered - weird slime that changes color with body heat, magnetic slime that slithers towards magnets, and even slime that glows eerily in the dark. Kids can learn the science behind these amazing hydrophilic polymers while mixing up gobs and gobs of slime. — As of 05/12/2012 this product had 4.3 out of 5 stars from 15 reviews on Amazon.com. Cons: Too messy; supplies run out too quickly; does not come with containers for the slime. — John Blair, owner of Science Safari in Cary, N.C., told TDmonthly in late Spring 2011 that he sells 3-4 kits from Scientific Explorer each month. The Discovery Channel's Mythbusters find the truth behind urban legends using the scientific method and plenty of curiosity and ingenuity. Their unique, offbeat and often-explosive approach to science comes to a science kit that helps kids discover the powers of air pressure. Can air cause your stomach to explode? Will air help your bones predict the weather? If you get the air free, can you save your house during a tornado? Designed to teach girls about cosmetic chemistry, this kit includes ingredients to make custom scents and indulge in a crystal mud treatment and a sea salt scrub. Girls can also buff and shine their nails for a finished look. — Two of 40 retailers cited Scientific Explorer as a best-selling educational brand in fall 2009. The Curiosity Zone in Ashburn, Va., sells dozens of Scientific Explorer kits per month, Owner Mary Porter told TDmonthly. Inspired by her beloved King Charles, college student Elizabeth Rives created this fun-filled kit for kids and their pets while she was working part-time at Scientific Explorer. Pamper your Dog will have pets woofing with delight over yummy, nutritious dog cupcakes. Children can give their canine friend a healthy scrub with homemade shampoo, brush those long teeth with special doggie toothpaste, and learn the secrets of a great massage for their furry friend, as well as design a unique "dog tag" for an ID. Insights into canine thinking will turn kids into real dog psychologists. The kit "helps teach social responsibility in a fun way," Scientific Explorer's Vice President Susan Rives told TDmonthly. Launch date: 2008. This kit comes with all the supplies children need to make hard candy, liquid candy, powder candy, lollipops and much more. This 23” rocket takes only minutes to assemble and can soar up to 300’ in the air. Experiments with baking soda and vinegar offer an introduction to chemistry and physics. How do airplanes fly in the sky? With My First Airplane Kit, children can learn all about flight. They can build and paint easy-to-make airplanes with pens, and then watch their custom aircraft soar through the sky. Next, using their planes and other components, they can conduct experiments to learn about gravity, lift, drag and thrust, the forces involved in flight. This kit “tailors the fascinating world of flight to the young child. Not only can you build, paint and decorate planes — but you can also use these planes to conduct experiments,” Susan Rives at Scientific Explorer told TDmonthly. Launch date: May 2007. — Idanna Smith, owner of Juggles in Wakefield, R.I., cited My First Airplane as one of the best toys at Toy Fair 2007. — Scientific Explorer experiments do well, Owner Fred Rosenberg of On the Park in Kingwood, Texas, told TDmonthly in spring 2007. With this kit, children can mix more than 15 flavor combinations to create their own crazy concoctions and make huge amounts of homemade gum. “This kit contributes to a child’s educational development because it involves a lot of creativity,” Susan Rives of product development for Scientific Explorer told TDmonthly. “Kids are encouraged to come up with their own custom gum flavor….After they’re satisfied with the gum, they can design its packaging.” Launch date: August 2006. — “Scientific Explorer science kits. [Kids] can make candy, do slime, the bubble gum factory, dino kits,” Denis Hofsetter, owner of The Toy Store in Atlanta, Ga., listed some favorites in his best-selling educational line. — “In the science and nature category, we sold 45 last month,” Margy Pein, owner of Tree House Toy Shop in Cumberland, Md., told TDmonthly in July 2008. — Twelve percent of retailers said science kits and related activities account for their top-selling educational products. With this indulgent kit, girls can transform a bath into a frothy fizzing sea of color and fragrance. They can make colorful, fragrant bath soaps, fizzers and oatmeal scrub while learning the science behind gels, fragrance and more. This kit “is not about being a stick figure or a beauty queen, but rather about relaxation and learning….While mixing and matching custom fragrances, kids can learn about the science of smell. While whipping up a fizzy bath ball, kids learn about how acids and bases react,” said Elizabeth Rives of Scientific Explorer, who created the kit for the company while still a college student. Launch date: February 2003. — “Scientific Explorer. Anything at all sells well,” Carolyn Meyer, owner of Blue Turtle Toys in Dayton, Ohio, told TDmonthly. — “The line we do best with is Scientific Explorer, because it's a complete kit and it's easy to understand,” said Greg Bonner, owner of Heights Toy Center in Little Rock, Ark. — Want this? 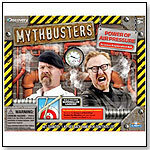 As of 05/06/2011, this product was available for purchase at Magic Box Toys. This kit contains more than 20 different activities, from concocting a stink bomb to making itching powder from scratch. The kit received iParenting Media’s “2004 Great Holiday Winter” award. It “reveals the secrets behind pranks while encouraging social skills. Kids have a great time laughing while they learn!” Jean Bessette of Scientific Explorer told TDmonthly. Launch date: February 2004. — In a summer 2010 survey, three of 43 specialty retailers named Scientific Explorer kits a top-selling product in the science and nature category. One retailer cited the Soda Pop Science Kit as a favorite. — “Scientific Explorer is our number-one science line,” Casey Sartain, buyer for Tutoring Toy in Salt Lake City, Utah, told TDmonthly in August 2010. Introduce young kids to the magic of chemistry. This kit includes a microscope that magnifies 100x, 200x and 450x and comes with safe accessories. The science guide contains easy introduction activities to perform with the microscope. Kids learn about chemistry as they make a beautiful ornament and test acids and bases. The kit includes lots of activities and experiments for a younger scientist. — "Scientific Explorer makes the ... My First Chemistry Set, and those have always done well for me," said Alison Cox, owner of Animal Quackers in Raleigh, N.C.
— Cox told TDmonthly in summer 2007 that she sells about five kits a month from Scientific Explorer. — "The First Chemistry Set is for young children and parents to be introduced to a microscope as well as fun activities involving chemistry and chemical reactions. It's just fun to do,” Susan Rives of Scientific Explorer told TDmonthly. Kids can make therapeutic lotions and fizzy scented baths to turn their frenetic sleepover party into a relaxing spa experience. Components include sea salt, oats, lavender oil, citric acid, pipette and a science guide. The kit was launched in 2005. — “One of the big fun ones was Scientific Explorer, Spa Time, which has lotions and things like that,” enthused Kate Tanner, owner of Kidstop Toy & Book Store in Scottsdale, Ariz.
— “Scientific Explorer went out on a limb and did the perfume kit, where you mixed your own chemicals, and then they did a Spa kit and made facial washes. We sold a lot of that for sleepovers,” shared Greg Bonner, owner of Heights Toy Center in Little Rock, Ark. — “Anything makeup-related,” does well with tweens and would be good for a slumber party, recommended Tricia Cooper, buyer at Le Jouet in Metairie, La. — “The Scientific Explorer kits are great sellers for me,” explained Jeff Boss, owner and president of Brain Builders, Moorepark, Calif. This science introduction kit for younger kids includes a color-mixing laboratory where kids can turn their favorite colors into soft crystals, capture a rainbow in a test tube and become color-mixing detectives. — “Scientific Explorer kits, especially My First Science Kit” are a top-selling science item at Tom’s Toys Inc. in Great Barrington, Mass., Owner Tom Levin told TDmonthly in August 2008. — Seventeen percent of 65 retailers said Scientific Explorer was their top-selling science kit supplier. — In late summer 2009, five of 38 retailers told TDmonthly that Scientific Explorer, or a specific kit in the line, accounts for their best-selling science and nature products, though one retailer showed concern about the brand’s expansion. Our best-selling line is Scientific Explorer, but that remains to be seen now that they are all in the Barnes & Noble bookstores,” Diana Nelson, owner of Kazoo & Co. in Denver, told TDmonthly.